A generous anonymous donor is offering to match donations to support our fight against rodeo cruelty and to help our Go Veg campaign. The matching grants mean your donation will be doubled, up to $10,000 for each program! Our campaign against cruelty at the Chilliwack Fair rodeo, the Calgary Stampede and other rodeos will continue this year and your contributions, aided by the matching grant, will allow us to draw greater attention to the plight of rodeo animals. 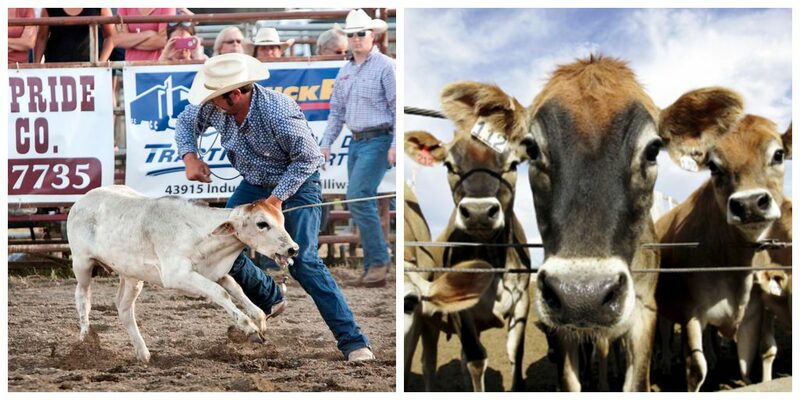 Last year, Vancouver Humane exposed the use of electric shock devices at the Chilliwack Fair rodeo, which received considerable media coverage. We’ll put the spotlight on the rodeo again this year and keep up the pressure on sponsors. Your doubled donation will also help our Go Veg campaign, allowing us to educate the public about the suffering of farmed animals, promote a plant-based diet and reduce the overall consumption of animal-based foods. We’re also supporting a growing number of institutions, from food service providers, schools and hospitals to corporate cafeterias, in reducing their offering of animal products on menus in favour of more plant-based foods. Your gift will allow us to expand this important campaign and go even further to help farmed animals. The funds raised will help us run more Go Veg bus ads, attend more public events and distribute more Go Veg leaflets. We will be able to offer additional culinary support for institutions looking to transition more of their menus to plant-based and we will advocate for policies that prioritize plant-based foods, as well as stronger regulations to protect animal welfare. Together we can create a kinder and more humane society for all animals! To donate just click here. From the drop-down menu choose the Rodeo or Go Veg funds to ensure your donation is doubled.